Bread Pudding is an old fashioned dessert that had its humble beginnings in 13th century England. It was first known as a "poor man's pudding" as it was made from stale leftover bread that was simply moistened in water, to which a little sugar, spices and other ingredients were added. Fast forward to today and you will find that we still make our bread puddings with bread but the breads we use are often made especially for this dessert. The types are wide ranging; from brioche, challah, croissant, and panettone, to French, Italian and sometimes even raisin bread or scones. And unlike bread puddings of the past, we now moisten the bread in a rich mixture (really a custard) of cream, eggs, sugar, butter, vanilla extract, and spices. It is no longer a poor man's pudding. It is now a rich, creamy, decadent dessert that has made its way onto the dessert menus of many fine restaurants. To make a Bread Pudding the bread is first cut into bit sized cubes and the choice of whether to remove the bread crusts is yours. The cubes of bread are then placed in a 9 x 13 inch (23 x 33 cm) baking pan. Then we need to make the custard which is then poured over the bread cubes. You can add chopped nuts, pieces of chocolate, lemon or orange zest, a little alcohol, candied, dried or even fresh fruits to the pudding for more flavor and texture. The one thing to take note of, though, is that this pudding is baked in a water bath. A water bath starts with a large shallow pan (usually a roasting pan of some sort) that is big enough to hold a smaller pan that is filled with a delicate food. It is best to place a clean dish towel on the bottom of the large roasting pan to prevent the dish from moving about during baking. Once you have placed the smaller dish inside the large roasting pan, hot water is poured into the larger pan until it reaches about halfway up the outside of the smaller dish containing the food. This is then placed in a slow oven. We do this because a water bath prevents delicate foods, like this bread pudding, from burning, drying out, or curdling (when a milk or egg mixture separates into its liquid and solid components). Just make sure to occasionally check the water level during the baking time, adding more hot water as necessary. 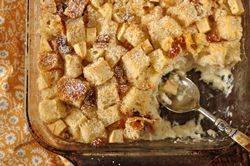 Bread Pudding: Preheat oven to 300 degrees F (150 degrees C) and place rack in center of oven. Lightly grease with butter, or spray with a non stick vegetable spray, a 9 x 13 x 2 inch (23 x 33 x 5 cm) heatproof baking dish. Place the baking dish into a larger roasting pan that has enough room around its sides to fill with water. Place the bread cubes and fruit (if using) in the baking dish. Custard: In an electric mixer (or with a hand mixer), beat the eggs and sugar on high speed until thick and lemon colored (about 4-5 minutes) (when beater is raised the batter will fall back into bowl in a slow ribbon). Beat in the vanilla extract and ground cinnamon. Then beat in the melted and cooled butter and half and half (light cream). Assemble: Carefully pour (or ladle) the prepared custard over the bread cubes until completely covered. Press down the bread cubes so they are covered with the custard. Prepare a water bath. (A water bath is used to provide temperature protection for the egg custard.) Carefully pour in enough hot water so that the water is halfway up sides of the 9 x 13 inch baking pan. Bake about 1 hour or until toothpick inserted in the center comes out clean. Another way to judge whether the pudding is fully baked, is to gently press down on the center of the pudding. If any custard comes up to the top, the pudding needs to be baked a little longer. Remove the bread pudding from the water bath and cool slightly before serving. Can be served warm or cold with a dusting of confectioners' sugar and a dollop of softly whipped cream or vanilla ice cream. Note: Breads to use - French, Broiche, Challah, Croissant, Italian, and/or Panettone. The bread can be fresh or stale and crusts can be left on or removed. You can also use day old scones. Variation: Can replace 2 tablespoons of the milk/cream with 2 tablespoons of brandy or rum.